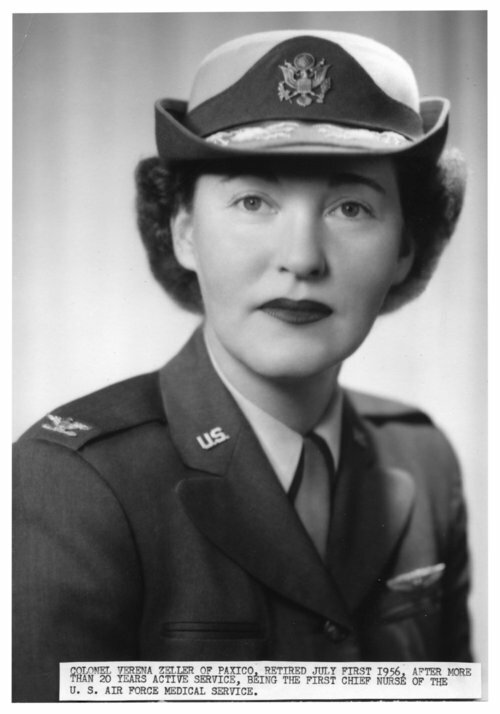 Three photographs of Verena Zeller, the first appointed Chief of the U.S. Air Force Nursing Corps. She was born in 1912 in Paxico, Wabaunsee County, Kansas. She received her nursing training at the St. Francis Hospital School of Nursing in Topeka and graduated in 1934. Previous to joining the Air Force, she had worked for six weeks with the Red Cross in the Dust Bowl area of western Kansas, Oklahoma, and the Texas panhandle and held a civilian position at Fort Riley, Kansas. She then continued to work at Fort Riley with the rank of 2nd Lieutenant in the Army. She received many promotions during World War II and afterward and traveled extensively around the world because of her duties. In the inter-war years of the late 1940s she served as a flight nurse, assisting wounded soldiers who had been evacuated back to the United States. She is one of only three women with the rank of colonel during the military action in Korea. In 1949, Zeller married Marco J. Pettoruto. Following his death in 1976, she moved to Topeka, and in 1990, she married Dr. G. Herbert Seburg. Verena Seburg died in December 2007.